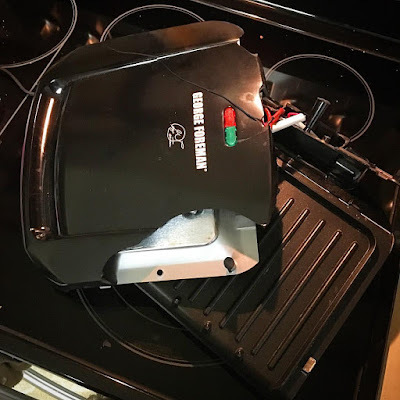 We lost George Foreman in a horribly unfortunate tragic accident last evening. "He" was preparing to cook dinner for my daughter and me, but a short time before that occurred, he was sitting precariously on his perch on top of our Refrigerator. My daughter had just helped herself to a snack from the Fridge, and closing the door caused it to vibrate just enough that poor George slipped off and came crashing down onto the kitchen floor, shattering his protective shell and breaking his spine, exposing his innards, and effectively killing him. We're now in a period of mourning. We're also hungry. Mr. Foreman joined our family about six weeks ago, on Christmas morning. He was a welcome addition and quickly enamored himself to the other kitchen appliances with his quick-cooking ability mixed with quality results, bringing rarely seen juiciness and flavor to both hamburgers and poultry. The Range, in particular, took him under his oven door wing, much like a father guiding his son. While the Microwave exhibited jealousy, the Dishwasher was pleased that fewer pots and pans needed to be washed due to George's efficiency. George was accepted with honor by the small appliance gang, joining the Crock Pots and the Toaster Oven on top of the Refrigerator. Following George's death, the Fridge fell into deep mourning, blaming himself for George's accident. Mr. Foreman is survived by the Range, the Microwave, the Refrigerator, the Dishwasher, the Crock Pot, the larger Crock Pot, the Toaster, the Toaster Oven (no relation), the Blender, the Keurig, the Hot Dog Toaster, the Iced Tea Maker, Faithful Pup Scout, daughter Melody, and me. Services were held minutes after the accident, and burial in the kitchen trashcan followed immediately. Donations in lieu of flowers may be given to the Small Appliance Fund, c/o The Blog. Have a great evening, everyone. Rest In Pieces, George Foreman Grill.